Yes, I know. I just wrote about salmon in my last post. And I’m writing about it again today. Deliciously redundant because it is, in fact, officially salmon season now that the first gleaming specimen has made its way south from the Copper River up in Alaska. I’ll admit to not having had a bite of the glorious Coppers yet, the most well-known harbinger of salmon season. But I did, yesterday, have a most extraordinary lunch of Washington State troll-caught king (Chinook) salmon at a wonderful annual tradition, a trade lunch held at Lark restaurant. Chef/owner John Sundstrom outdid himself. Not only was the preparation amazing — the salmon crisp-skinned with morels, peas, young garlic — but the fish was PERFECTLY cooked, serving about 50 people at once. Wow, so incredibly delicious. The hosts were the Makah Tribe and the Washington State Trollers Association, giving chefs, retailers, writers and other professionals the opportunity to taste amazing wild salmon truly from our own backyard. Alaska salmon is a treat, no doubt. And the state provides solid supplies to keep us well-fed in that wild treasure. But when we can find Washington-caught salmon (fish that doesn’t even have to catch a flight to hit our plate) — like that Shuksan strawberry or locally foraged sea beans — it’s time to leap at the opportunity. Carefully managed quota systems help assure a sustainable harvest; the season this year runs May 1 to late June and July 1 to mid-September, pending catch limits being reached sooner. Specialty seafood retailers such as Wild Salmon Seafood Market and Whole Foods tend to carry Washington troll-caught fish when available. The salmon we had yesterday were of the “marbled” variety. 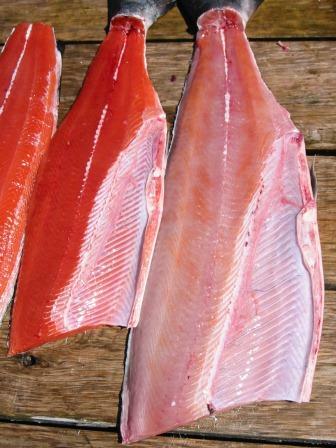 You’ve probably heard of “white” or “ivory” salmon, which has very pale flesh. Marbled salmon have neither solidly red-orange flesh nor fully pale flesh but a mottling of both colors. It’s the carotenoids in the salmon’s diet that contribute to the color of their flesh. Different species assimilate the carotenoids differently, which is why sockeye are generally deep red and coho often more moderate pink. But within a species, individual fish can have genetic variances that just don’t allow color to be created in their flesh like it is in other fish. Aside from that cosmetic variance, they are fully the same species as other kings. There’s apparently a stigma out there about the marbling, some folks take a look at the oddly colored flesh and think something’s off. In fact, the flavor is divine, at least as delicious as other kings. And the oddball coloring fades away during cooking, as the color tends to look evenly pink when cooked. On that trip to King Pacific Lodge that I just wrote about, I caught 2 salmon on my fishing excursion. One vividly red, and one with–what I saw as–a stunningly beautiful marbled effect! OK, enough talk about salmon, how about a recipe. Though, honestly, if you’ve got an amazing piece of salmon in your hands often the very best thing to do is as little as possible. Sprinkle some crunchy salt over, grill with no embellishment, and enjoy. But I couldn’t have published much of a cookbook based on that principle, so came up with some recipes to use for variation! This was one of my favorites from my book, Salmon. I picked this one in honor of Memorial Day and the unofficial start of grilling season that it denotes. Even if it’s going to be 58 degrees and rainy in Seattle; we’re made of hardy stock around here, we can grill in the rain! (I will instead be wilting down in Austin, Texas.) I broke out the grill for the first time since the Thanksgiving turkey a couple days ago. Christened a new grill grate that continues to add years to my beloved red Weber kettle grill that I’ve had for 15-plus years. So here’s to grilling and salmon, and summer being around the corner, and to cherishing Northwest foods that make life here so delicious. For the basil mayonnaise, combine the egg yolk and vinegar in a medium bowl and whisk to blend. Begin adding the olive oil a drop at a time, whisking constantly, until the yolk begins to turn pale and thicken slightly, showing that an emulsion has begun to form. Continue adding the rest of the oil in a thin, steady stream, whisking constantly, then whisk in the basil and basil oil (if using), with salt and pepper to taste. Alternatively, the mayonnaise can be made in a food processor: pulse the egg yolk and vinegar to blend, then add the oil in a very slow stream with the blades running, and blend in the basil, basil oil, and salt and pepper at the end. Refrigerate the mayonnaise until ready to serve; it will have fuller, more balanced flavor if made at least 1 hour before serving. Cut the salmon fillet into medium dice and pulse it a few times in a food processor to finely chop without making a puree. Put the salmon in a large bowl with the onion, basil, lemon zest, salt, and pepper. Stir to evenly mix, then form the salmon mixture into 4 burgers about 4 inches across and 1 inch thick. When the grill is heated, lightly rub the grill grate with oil and grill the burgers until they are just opaque through and moderately browned, 3 to 4 minutes per side. While the burgers are cooking, toast the buns on the outer edge of the grill if you like. To serve, set the salmon burgers on the bottom bun, top with a good dollop of the basil mayonnaise, followed by the lettuce, tomato and the top bun. Serve right away. * If time is of the essence, you can make a quickie basil mayonnaise by stirring the minced basil and basil oil into 3/4 cup of top-quality mayonnaise.